The year is 2017. America has become a police state and its citizens are mollified with a steady diet of violent television shows, where convicts try to survive an invariably lethal obstacle course. 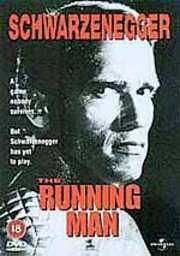 Arnie plays a prison escapee and sometime freedom fighter who, recaptured, finds himself running for his life on the show.